So Kamal Short Kurti Latest Dresses Collection 2013 opened their first outlet and first collection release which was known as acclaimed Kamal Lawn by Élan. Products by so Kamal are Bed linens, Fabric, Lawn and ready to wear products. Outlet by these brands is world wide due to its popularity and fashion demand. In these countries UK, Latin America, USA, Canada, Australia and Europe are included. So Kamal has become today young girls and women most favorite and ideal fashion brand due to the quality it provides. In this article we bring the latest dresses collection which is released by So Kamal fashion wear house. 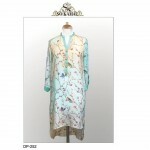 This collection is named as “So Kamal Women Short Kurti Dress Collection”. In this collection designer has emphasized on the trend recently introduced to the world of fashion, is that the back side of shirt is slightly long in length as compared to the front. Same thing is copied in this collection.